Margaritaville Restaurant is a fun place to dine if you have never been. With several locations to serve you, the Pigeon Forge location was a new visit for me. 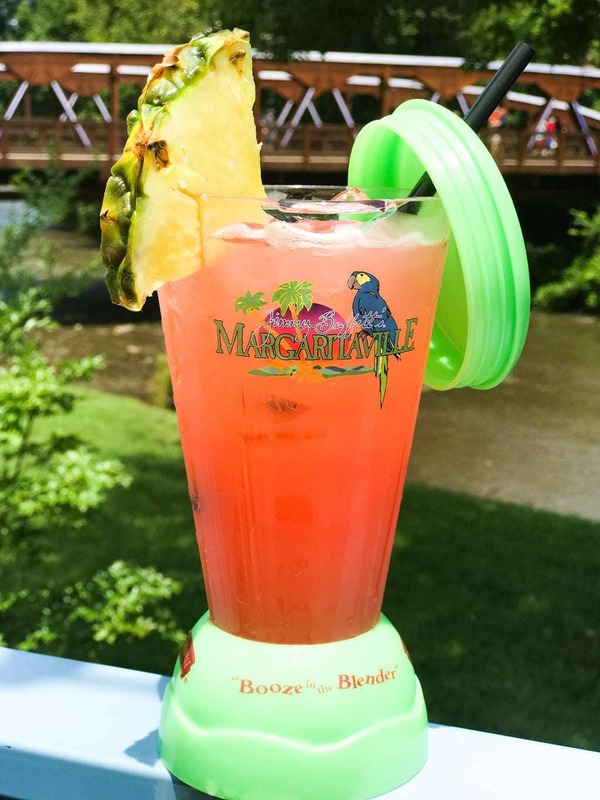 Margaritaville Pigeon Forge will transport guests to the island destination of their memories or their dreams and invites guests to raise a glass and take a bite out of paradise. My family and I recently made a weekend trip up to Pigeon Forge to visit family and we stopped here for lunch on our way home. I was provided with a complimentary lunch to help facilitate this review. All opinions are 100% mine and were not influenced by Margaritaville. Located in The Island of Pigeon Forge, this two-story restaurant is directly across from the new 4 Star Margaritaville’s Hotel. You can spend all day at The Island of Pigeon Forge. They offer just about everything from entertainment, unique dining, and shopping. Although it was really hot that day and the outside seating area looked great, we decided to stay inside where it was nice and cool. It was nice to sit back, relax, eat, and sip on some refreshing drinks inside. 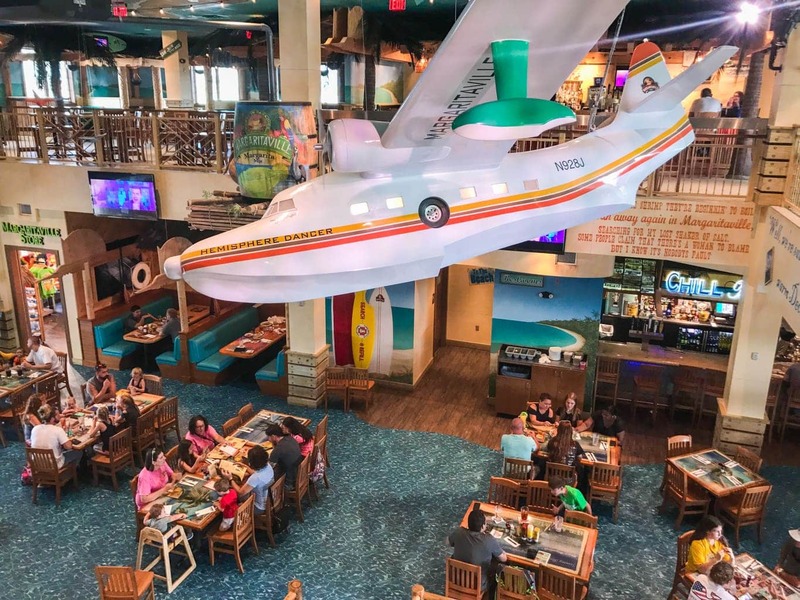 The Margaritaville Restaurant has become a local favorite in Pigeon Forge, and for good reason. The atmosphere has an inviting Caribbean theme, and fun lyrics playing in the background inspired by Jimmy Buffett. You truly feel like you are on a Caribbean Island somewhere sipping on some delicious margaritas or frozen daiquiris. Speaking of tasty drinks, it was 5 o’clock somewhere and their drinks were calling my name. I ordered the refreshing, 5 o’clock Somewhere on the rocks, served in the famous “Booze in the Blender” souvenir take-home cup! It was oh, so tasty and with bursting fruit flavor! The staff is very friendly and our server was great! He was super attentive to our needs and provided us wonderful recommendations from the menu. 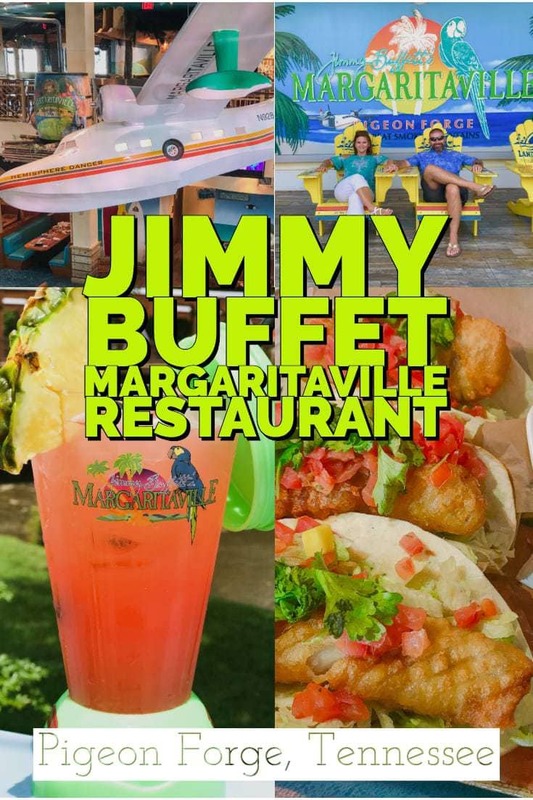 Margaritaville has a great menu option that will surely satisfy taste buds for the whole family. 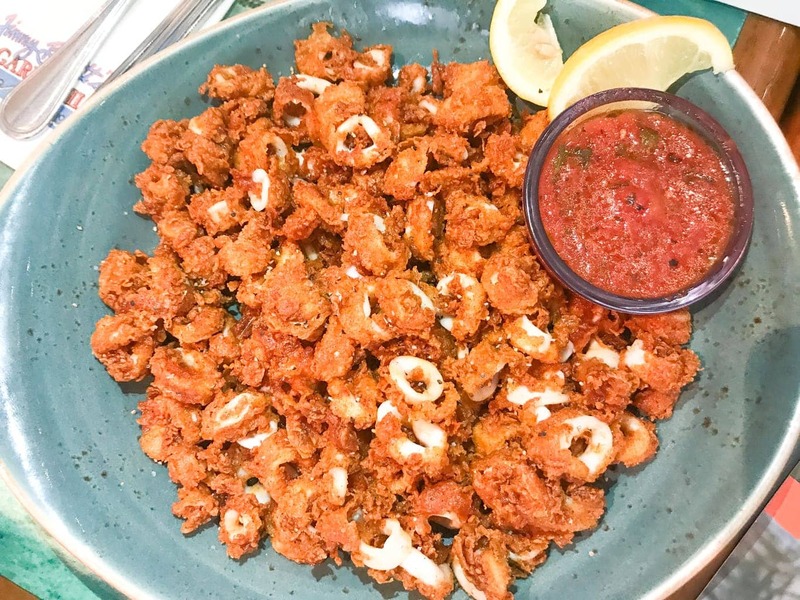 For starters, we ordered the Crispy Fried Calamari and Key West Chicken Quesadillas. However, on my next visit, I want to try the massive size Volcano Nachos piled high with yummy toppings. It seemed like that was a popular choice among guests dining in and I can see why! They looked so delicious! I can’t imagine one person ordering it by themselves. I ordered the fish tacos, which came highly recommended. 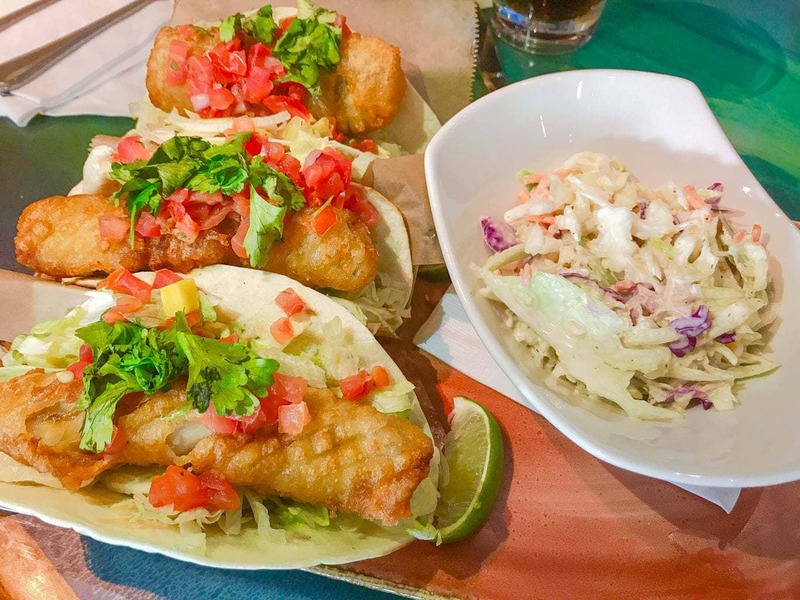 The fish was fried with the perfect crisp in their Landshark batter, topped with fresh avocado, cilantro lime coleslaw and key lime crema. Served with black beans, rice and pico de gallo. Every bite was full of deliciousness! My husband ordered the Cheeseburger in Paradise, made with 100% fresh, premium Black Angus beef. My daughters both enjoyed the Burger and Fried Shrimp from the children’s menu, and the portion sizes were more than enough! The girls both agreed their food was full of flavor, and very filling.